Virgin Atlantic has neatly leapt onto the stunt marketing bandwagon with this fun activation in Manhattan. To showcase the service customers should expect on-board, the airline devised a series of unexpected scenarios for anyone who sat on the Virgin Park Bench. The campaign set out to give people ‘a taste of the Virgin Atlantic experience’ by treating them to a series of well-orchestrated surprises. Not only did this cause a stir in Manhattan, the campaign was also recently awarded a Silver Lion in Cannes. The video is now being picked up on social media, which is pushing the grounded first class experience to a global audience. 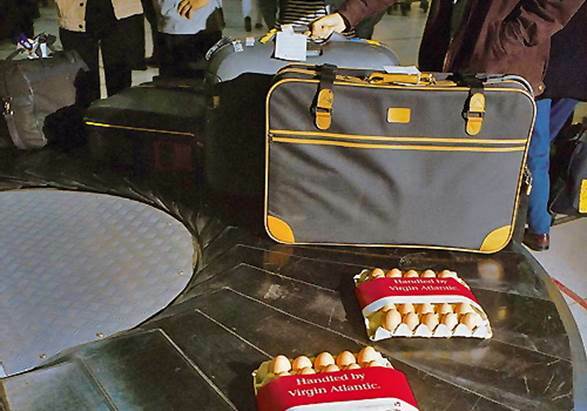 This also gives us a chance to salute another guerrilla campaign from Virgin where egg boxes, containing real eggs, were placed on baggage collection conveyer belts in between customer’s bags. It was a brilliantly simple and understated way to alert passengers to the efforts of the Virgin Atlantic team that put a smile on jet-lagged faces and got people talking.